888-665-0264 - CALL THIS NUMBER FOR SPECIAL PRICING! 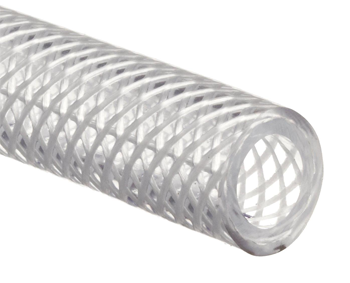 This tubing is equivalent to Tygon® B-44-4X-IB and handles four times the pressure of non-reinforced tubing. It is a flexible alternative to rigid piping systems, and compatible with virtually all non-solvent chemicals. Excelon Braid Pressure tubing is not affected by reducing and oxidizing agents, and is very easy to clean: the smooth inner bore resists bacteria growth. Made of non-toxic, FDA-sanctioned material, Excelon Braid Pressure Tubing does not affect the taste or smell of transfer fluids and gases and is suitable for use in a variety of applications including medical, food, and beverage. This tubing meets FDA, 3-A and NSF criteria. Industry standard for liquid handling of sodas, juices, teas, and bottled water. Reliable choice for transfer of liquids and gases in today’s laboratory applications. Smooth tubing perfect for food, milk and dairy tubing.